Altruis the Sufferer is a renegade night elven demon hunter originally brought to Outland by Illidan Stormrage. He ultimately left the Betrayer's service when he decided that Illidan had become the very thing he was sworn to fight, making camp in western Nagrand with his nether drake mount, Nethrandamus, and making plans against the Burning Legion encampments there. Akama admired Altruis for opposing the direction Illidan was taking. He was eventually captured by the night elf Wardens, who imprisoned him along with the other demon hunters in the Vault of the Wardens. Freed during the Third invasion of the Burning Legion and although reconciled with his Illidari brethren, Altruis still does not condone Illidan's methods and wants new leadership for the Illidari. Huntress Kima noticed a being riding atop a nether drake who arrived in Telaar a week before interacting with the adventurer. That being introduced himself as Altruis and then proceeded to ask several questions about Nagrand. He claimed that he was hunting Legion, that such insanity was actually his job. Kima asked the adventurer if they could imagine a person that would willingly hunt demons. Before he left, Altruis asked Kima that they let the would-be heroes in town know that he would be staying in western Nagrand for awhile and that should they seek a purpose, to find him. The adventurer thus went and did so. Altruis first asked them if his appearance startled them, and if they knew what he was. He then asked them what they saw when they looked to the west, to which they answered twisted steel and smell sundered earth. Altruis said that he saw a precursor to invasion. He thought that his master Illidan Stormrage was indeed wise in sealing the portals, but that he had since lost his focus. The Legion was seizing opportunity, they seeped out, and grew in number day by day. Altruis explained that he could see demons as clearly as the adventurer could see their own hand in front of their face, and that under normal circumstances, he was able to sense the presence of a demon from a thousand paces. But now, they eluded him, he could not see past their defenses, as they had put in place wards to prevent detection. He believed that the demons feared them because they knew that they feared nothing. The cost for such power was great, and the sacrifices many. Turning to the adventurer, Altruis claimed that they had to stop them before the forge camps that littered the landscape were able to complete whatever it was that they were building. As the Legion's mo'arg and gan'arg built weapons of mass destruction at these mobile forges, Altruis said the adventurer would be his eyes, and their weapons his fury. The adventurer riding Nethrandamus and surveying the lands. But to be his eyes would require some diligence on the adventurer's part. Nethrandamus, his nether drake, would take them through the Burning Legion camps, but they had to catalog everything that they'd see. Even the smallest detail that they may think to be inconsequential could be useful for their purposes. Primarily, Altruis wanted them to note what structures were in the camps and what comprised the camps' defenses. Nethrandamus would also keep them safe from harm. The adventurer thus rode the nether drake and, the survey complete, returned to Altruis. From the information that the adventurer collected, Altruis found that there were two primary camps: Forge Camp: Hate, directly west of where they stood and Forge Camp: Fear, directly southwest. Each camp had a Legion transporter, one forge, and several spell warding towers. Additionally, the camps were guarded by wrathguards manning fel cannons. Lastly, each camp had an overseer. They now had a point from which they could plan their counter-attack. As long as the transporters stood, nothing they could do to the forge camps would have any permanence, explained Altruis. They had to find a way to destroy the Legion structures. While Altruis devised a plan of attack, the adventurer kept their engineers and tinkerers busy, greatly slowing down their progress, and buying him the time he needed. Altruis advised the adventurer to stay as far away as possible from the overseers, as they were extremely dangerous beings, before the bravo hero went and killed many demons. The demon hunter eventually figured that there was no conventional means of destroying fel steel. However, all forge camps had a master planner. The master planner dictated what types of structures were present at a forge camp and how each structure was situated. Moreover, this information was kept on a set of blueprints that the planner carried around on their person. They needed the master planner's blueprints. Armed with such exacting information, Altruis could persuade an acquaintance of his to lend some assistance. The adventurer thus found the mo'arg master planner stationed behind the forges and took his blueprints. The blueprints were then taken to the Lower City of Shattrath, where a mo'arg by the name of Sal'salabim dwelled. He would probably be at the bar, thought Altruis, drinking away his sorrows. The adventurer had to convince him to lend his assistance, first with patience and understanding, and eventually with fists if that first approach didn't work. Sal'salabim agreed to help the adventurer, and he recognized his own design. Pointing at the architecture and formations on the blueprints, he asked them to look at the towers. But before going further, the mo'arg demanded that they helped him first. Giving the adventurer a ledger, Sal'salabim explained that the creatures described inside owed him a lot of gold. The adventurer thus went to collect Raliq's, Coosh'coosh's and Floon's debt. The task done, Sal'salabim pointed out the fel cannons on the blueprints. Drawing an arrow denoting a change of direction, he explained that they could turn the cannons around and use them on the Legion's own structures, but more importantly, that each Overseer had a key to a cannon. Returning to Altruis, the adventurer was told to proceed and destroy the two Forge Camps, Hate and Fear, effectively halting the Legion's advances in Nagrand. Altruis is one of two characters the Slayer of the Illidari can choose to be their second-in-command, the other being Kayn Sunfury, whose ideals and plans for the Illidari are incompatible with Altruis' own. If the player chooses Altruis as their second-in-command, they later go on to recruit Akama. Altruis sent Kor'vas Bloodthorn to find the demon hunter to report to him immediately at Krasus' Landing. To find the Twinblades of the Deceiver, he and the demon hunter went to the entrance of the Violet Hold guarded by Warden Alturas to not permit anyone to enter the prison. By Khadgar's trust, Warden Alturas had no choice but to let them in. He told them that the Kirin Tor will not be responsible of any sacrifices taken. Altruis stood guard to let the demon hunter confront an eredar named Taldath the Destroyer to get answers of where Varedis Felsoul is. Eventually, the demon spilled out the information without warning and Altruis told the demon hunter to finish him off. Learning that Felsoul Hold in Suramar is where he and the artifact is at and Altruis got a bat ready for the demon hunter. Lyana Darksorrow and Illysanna Ravencrest were to accompany the demon hunter regardless of the outcome. Altruis warns the demon hunter that Varedis is a cunning adversary. Upon arriving at Felsoul Hold, the demons spotted the bats and Altruis told them to fly to a landing site quickly. Losing both Darksorrow and Ravencrest, the demon hunter leaped into the fray and punish them for their hubris. Altruis sent Kor'vas Bloodthorn to find the demon hunter to report to him immediately at Krasus' Landing. To find the Aldrachi Warblades, he said that Archmage Khadgar had something called a [Crystallized Soul]. He stressed that the Warblades could tip the war in their favor. Upon returning to the prison world of Mardum to make it their new home, Altruis addresses to the Illidari of the accomplishments of the demon hunter by obtaining the artifact. With the Fel Hammer in their control, they can plan out every aspect of their assault on the Broken Isles. Altruis was met by the adventurer and Khadgar at Illidari Stand in Azsuna. Surprised and really impressed of the artifact the champion wielded, he told them to assist Allari and Jace as best they can to maintain ground against the demons there. He instructed the champion, Cyana Nightglaive, and Kor'vas Bloodthorn to attack from within the legion camp ahead. Unfortunately Cyana betrayed them to Legion and the Illidari were swift to put her down. Her death was a blow for the Illidari cannot afford to lose even a single demon hunter in their ranks. Under Khadgar's direction Altruis directed adventurer to meet up with the blue dragons that live nearby citing they can be prove to be a powerful ally in the war against the Burning Legion. Altruis was the first to become the champion's cause in their campaign. After collecting essences to communicate with their master, it was time to seek out other allies. Seeking the aid of Akama the Illidari sneak into the Black Temple. Though initially hostile to the Illidari Akama is convinced to rejoin the fold as he had admired Altruis for opposing Illidan. The Fel Hammer then jumped to the Legion world of Niskara to take out the Felsoul siblings. With their mission successful, he gave one of the highest honors to the demon hunter and declared them the Slayer and told them that their artifact can awaking great potential when the time came. Altruis participated in the Battle for the Exodar battling against High General Rakeesh, alongside Asha Ravensong. Both Altruis and Kayn together on the Fel Hammer. Altruis and Kayn were both aboard the Fel Hammer when the Slayer obtained the [Slayer's Felbroken Shrieker]. Altruis' old model in Nagrand, prior to Legion. What do you see when you look to the west, mortal? I see twisted steel and smell sundered earth. Do you know what I see? A precursor to invasion. Aye, the master was wise in sealing the portals, but has since lost his... how shall I put this? The master has lost his focus. Yes... focus. With this loss, the Legion has seized opportunity. They seep out now, growing in number day by day. The Burning Legion, Demons. I see them as clearly as you can see your own hand in front of your face. That is, I used to be able to see them clearly. With the Legion's return come new machinations. Under normal circumstances, I am able to sense the presence of a demon from a thousand paces. They elude me, I cannot see past their defenses. They have put in place wards to prevent detection. They fear us because they know that we fear nothing. The cost for such power is great, the sacrifices many. How do you see them now? We must stop them before these forge camps are able to complete whatever it is that they are building. That is what these structures that litter the landscape are called. The Legion have employed the mo'arg and gan'arg to build weapons of mass destruction at these mobile forge camps. Let us not find out what it is that they intend to build here in Nagrand! You will be my eyes. Your weapons will be my fury. This is what I have gathered from the information that you collected from the survey. There are two primary forge camps: Forge Camp: Hate, directly west of where we stand and Forge Camp: Fear, directly southwest. Each camp has a Legion transporter, one forge, and several spell warding towers. Additionally, the camps are guarded by wrathguards manning fel cannons. Lastly, each camp has a pit lord overseer. You honor me, <name>. Of course I will serve as your champion and right-hand man. How could I refuse? 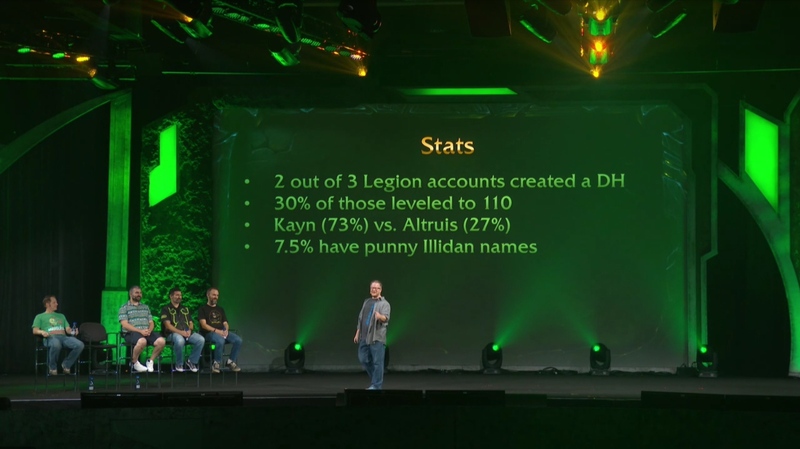 We have only just begun to change the way in which the Illidari operate, but already, you have made great strides. If we are to defeat the Burning Legion, it must be done in concert with everyone working together. Not just the Illidari standing alone. And not standing upon the smoking husk of a world that we have carelessly destroyed while trying to save it. Yes, I can see you. What do you want? Don't follow anyone blindly. Think for yourself. I fight by your side! [Altruis the Sufferer's Coin] can be fished up from the fountain in the version of Dalaran. Originally, Altruis lacked the iconic demon-binding tattoos synonymous with demon hunters. When his model was updated in Legion with the new demon hunter art assets, he gained tattoos as well as horns and a new blindfold. Non-demon hunters never see Altruis at any point in the Broken Isles, as he only appears at the Illidari Stand in Azsuna to demon hunters who chose him. All other classes see Kayn in Azsuna instead. Altruis is voiced by Greg Chun in Legion. Altruis' name is most likely derived from altruism, another word for selflessness. Patch 7.0.3 (2016-07-19): Added in Legion. ^  It's Just That Easy?